The ELD mandate rules that in 2019, nearly all U.S. commercial motor vehicles must now have an electronic logging device (ELD) in order to track drivers’ hours of service and ensure they comply with labor regulations. We take a look at what the ELD Mandate means for commercial drivers, what kind of data is being tracked, and how fleets can ensure they remain compliant with the law. The ELD mandate comes straight from the Federal Motor Carrier Safety Administration. Since it is relatively new — it kicked in on December 2017 and is being enforced with increasing strength across 2019 — the approximately 3.5 million professional vehicle drivers in the United States are learning what the new rules mean. State to state, trucking is the most common job in the U.S. After all, it hasn’t been automated and will never be outsourced. As a result, the ELD mandate will have a massive, nation-wide impact unlike any regulation in the past. Here’s a look at how the law works and what it means for vehicle drivers everywhere. The ELD mandate is one of the biggest changes to have come out of the Moving Ahead for Progress in the 21st Century Act (MAP-21) which was signed into law in 2012. It specifies that every commercial driver in America must now record their hours of service through electronic logging devices, as of December 18, 2017. An ELD is a device that automatically records certain data elements at a set interval. These elements include date, location, time, engine hours, and vehicle miles, as well as identification information for the driver, vehicle, authenticated user, and motor carrier. The ELD will begin recording data in driving mode once the commercial motor vehicle (CMV) is moving at speeds beyond 5MPH, and can use in-motion mode at speeds lower than 5MPH. If the vehicle slows to 0MPH for 3 consecutive seconds, the ELD considers it stopped. An ELD requires software, and fleet operators must check that their new ELD software is compatible with their fleet management software (FMS) in order to ensure the two will work together after ELD installment. Some ELD providers package their ELD software with a FMS, but not all do. Why was the ELD Mandate Introduced? The ELD mandate was introduced in order to replace previously existing and less accurate methods such as paper logs and automatic on-board recording devices (AOBRDs, also known as EOBRs, for electronic on-board recorders) which keep Record of Duty Statuses (RODS). ELDs’ stricter tracking can be used to prevent employers from harassing their drivers and violating hours of service (HOS) laws. Contrary to some rumors, the ELD mandate doesn’t affect the federal rules already in place regarding a drivers’ hours of service. The official hours of service remain the same — FMCSA’s guidelines are available online — but will now be more easily enforced, thanks to the automatic logging capabilities of the ELD. An ELD must be standardized to the specifications of the United States’ commercial motor vehicle regulation agency, the Federal Motor Carrier Safety Administration (FMCSA), which oversees the data recorded. They offer a searchable list of approved devices. Owner-operators must shoulder the cost of installing Electronic Logging Devices or face fines. The majority of U.S. shipping operations added ELD devices over the first few months of 2018. 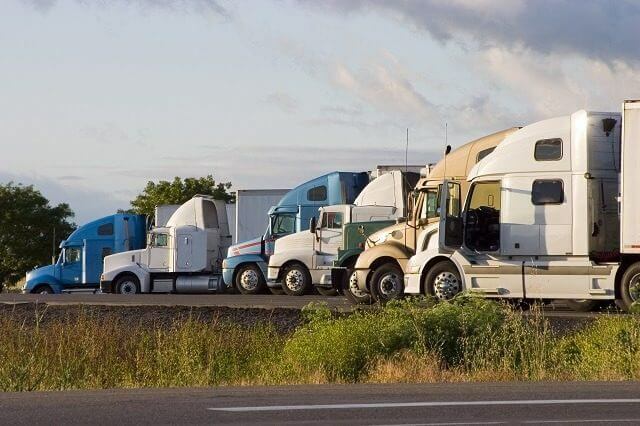 Some organizations were already using AOBRDs to track their hours: These operations are being grandfathered into the ELD mandate, and have until December 16, 2019, to switch to ELDs. But by 2020, all commercial motor vehicles in the U.S. will need to have an ELD installed, to comply with the ELD mandate. How Will the ELD Mandate Be Enforced? Commercial vehicle enforcement officials have been slow to enforce the new regulation, in order to allow fleet owners and operators time to adapt. But that window won’t last forever, so anyone who’s affected by the recent law change should know both how to comply with the regulation and what penalties they’ll face for failing to comply. ✔ Instruction sheet detailing the data transfer mechanisms supported by the ELD and how best to transfer the driver’s data to an authorized safety official. 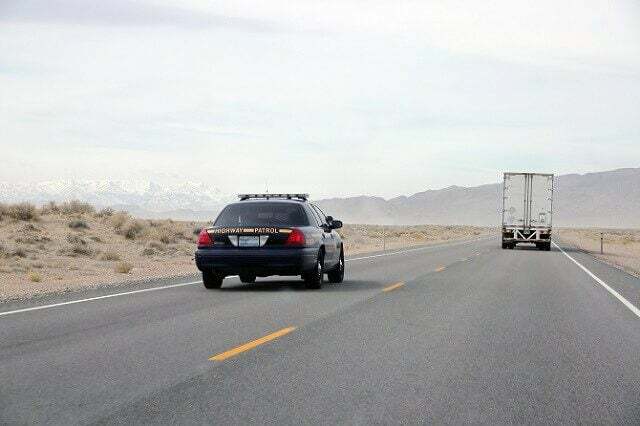 The U.S. commercial vehicle enforcement personnel will be responsible for writing up violations and the fines associated with them, and the exact nature of the punishment will be determined by the personnel — a fine of a few thousand dollars is typical, though fines can extend into the mid-ten thousands. Drivers without a compliant ELD will face a violation under section 395.8, which covers Hours of Service violations. The driver will be placed out of service (OOS) for 10 hours, or 8 hours if the vehicle is a passenger carrier, according to the Commercial Vehicle Safety Alliance North American Standard Out-of-Service Criteria. Once back in service, the driver should complete their current trip using paper logs. If stopped again during this trip, the driver should give the inspector a copy of the earlier inspection report and any additional evidence to show they have already been cited. Once the trip is complete, the driver must install and use an ELD before being dispatched again — if they don’t, they can be placed OOS again. However, a driver may return with an empty vehicle to their “principal place of business or home terminal,” which will be designated on the inspection report. These violations will be registered on the carrier’s Safety Measurement System (SMS) scores. Drivers using paper logs, if no more than 8 days out of a 30-day period — this allows drivers a second option if their ELD malfunctions. Drivers operating under the short-haul exceptions — they’re not keeping RODS, so there’s no need for an ELD. Driveaway-towaway operations — Drivers who drive to transport another vehicle for sale, lease, or repair won’t need an ELD. In addition to all of the above information, FMCSA has provided training webinars that can be accessed online, so you can verify whether any ELD mandate exemptions apply to you. In order to comply with the FMCSA’s ELD mandate, fleet operators must ensure they have a regulation-compliant ELD installed in every one of their vehicles. To do so, they’ll need to pick a company that offers an ELD system fit for the purpose. Size of fleet — The total number of vehicles in an operation can change which ELD provider is most attractive: You’ll want a company that provides ELDs to similarly sized fleets. Data needed — All the ELD providers must provide the FMCSA-mandated data, but some fleet operations are used to recording supplementary data with their current system, whether through paper logs or AOBRDs. Type of shipping service — If your operation uses less-than-truckload (LTL) shipping, a management system specifically designed for LTL may be best. Pricing — When requesting a quote, don’t forget to ask about monthly subscription fees. Areas covered — What geographic location will your vehicles cover? Customer service needs — Look into the customer support reputation of the ELD providers you’re considering. Are you comfortable with the quality of the support you’ll rely on if your drivers need any help with their ELD? General basic training courses are available online, such as one by JJ Keller and Associates — fleet operators should check their preferred ELD provider first, as some companies (KeepTruckin, for example) offer training courses specific to their product. 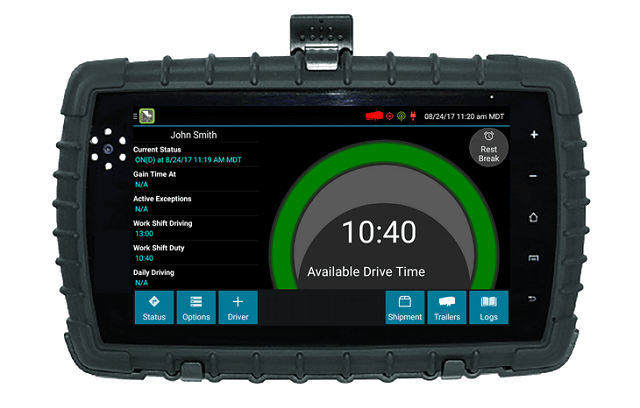 Smartphone ELD apps or other wireless Electronic Logging Devices are even an option for drivers, provided they fit the ELD mandate’s technical specifications. Installing ELD systems and training drivers is a big initial investment that — done right — will not negatively impact the bottom line on any sort of ongoing basis. Rolling out the ELD mandate over an industry as large as the trucking sector doesn’t happen without a few hitches. Several concerns have yet to be hammered out. Here’s what to keep an eye on in the coming months and years. While drivers are required to have an ELD in their vehicles, they might occasionally need to enter areas that require they don’t have an ELD. U.S. government and governmental contractor facilities may not allow any devices that track vehicle movements — particularly after an embarrassing case in which a fitness tracking app’s data made available a heat map of secret U.S. bases by tracking military personnel. According to Larry Minor, associate administrator for policy at FMCSA, drivers may remove their ELD after entering the gates of Department of Defense installations, as long as they note the time gap with an annotation in their ELD record. Drivers who plan to enter any other government facilities should check in ahead of time to see if the same rules apply. Since more drivers are expected to comply with the hours of service laws, some in the industry expect rest stops to become more congested. Why? Drivers who may once have pushed past their hourly limits, the logic goes, will now be clocking more frequent rest hours. However, it is unclear how significant this issue will be. Drivers may instead chose to drive fewer hours, keeping rest stop crowds the same while earning less. Or, if drivers do increase their rest stops, the effects may be spread out over enough hours and locations to avoid hitting full rest stop capacity. In May 2018, a Delaware Sargent in the state police’s truck-enforcement unit made his opinion known, saying “It’s been about the same as it always was,” though he noted that drivers seemed more aware of the issue than before. Whatever the case, this remains a concern to keep an eye on. Operators who don’t install ELD devices across their fleet will face fines when caught. And, at least in the next few years, a lot of them will be caught: 27,000 ELD violations have been noted between Dec. 18 and the end of February, by one count. But the end goal of the ELD mandate is to better document drivers’ work hours and shift breaks. Under the new mandate, actual violations should drop even if the number of tickets given for those violations rises. Under this logic, fewer tickets will be given out once drivers and operators have adjusted to the more strict enforcement. As time passes, government enforcement will only get stronger, so it’s important to stay aware of the law’s impact. Whether you’re a fan of the stronger regulations that the mandate ensures, or you’re more concerned with the financial impact of complying, the ELD mandate is here to stay.